Valid through to January 31, 2019, you can purchase Capture One Pro 12 and save up to $276 on Capture One Styles packs. 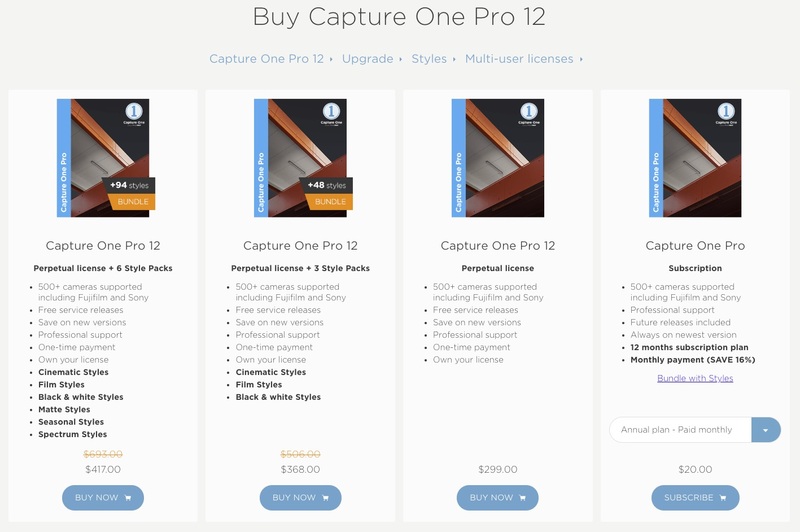 In order to qualify for the offer, you must purchase the Capture One Pro license and Styles Packs together directly from Phase One’s official Capture One store. A single user perpetual license can be activated on up to three separate devices and costs currently $299 / £299, so a saving of $276 / £276 on the purchase of 6 Styles Packs is quite substantial and practically the price of Capture One Pro alone. If you’re looking to switch to Capture One Pro 12 and the thought of buying Styles Packs to receive a discount doesn’t appeal, you can currently buy a Single User perpetual license at the usual price of $299 / £299 and a receive the Film Styles Pack free, saving $69 / £69. The offer is also available for Capture One Pro for Fujifilm and Sony.